This HTRF kit is designed for the rapid detection of human TREM-2 released by cells. The kit is designed for the rapid detection of TREM-2 (also known as Triggering Receptor Expressed on Myeloid Cells 2) in cell supernatant and whole cells. The TREM family of receptors regulates the activity of various cell types of the immune system, including neutrophils, monocyte/macrophages, microglia, and dendritic cells. Soluble TREM-2 has been detected in human cerebrospinal fluid (CSF), where it was found to be elevated in patients with multiple sclerosis and other inflammatory neurological conditions in comparison to patients without inflammatory neurologic disorders. 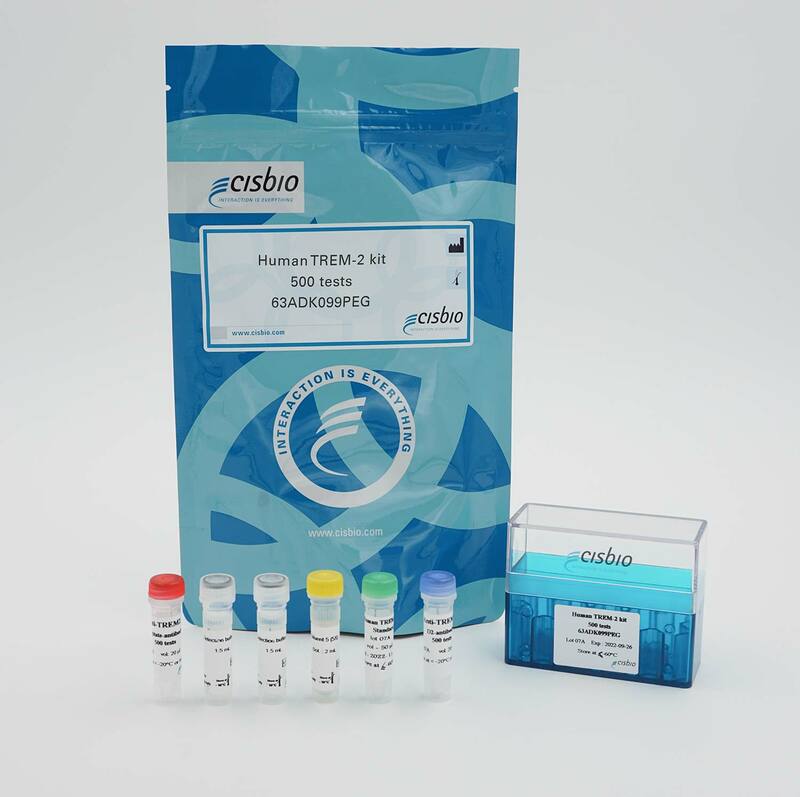 Human TREM2 is measured using a sandwich immunoassay involving two specific anti-human TREM2 antibodies, respectively labelled with Europium Cryptate (donor) and d2 (acceptor). The intensity of the signal is proportional to the concentration of the TREM2 present in the sample. The simple TREM2 assay protocol, using a 384-well small volume white plate (20 µL final), is described on the right. Cell supernatant, sample, or standard is dispensed directly into the assay plate for the detection of human TREM2. The antibodies labelled with HTRF donor and acceptor may be pre-mixed and added in a single dispensing step to further streamline the assay procedure. The assay can be run in 96- to 384-well plates by simply resizing each addition volume proportionally. THP1 cells were differentiated by adding 25 µM of PMA, causing cells to become adherent. The stimulation was done during 3 days. Once attached, the cells were allowed to recover in fresh RPMI + 10% FBS for 24 hours. Cell supernatant was collected after 24 hours and tested in the assay.